A very common use-case for ASP.NET WebForms application: you have a webpage with a GridView control populated from a database. 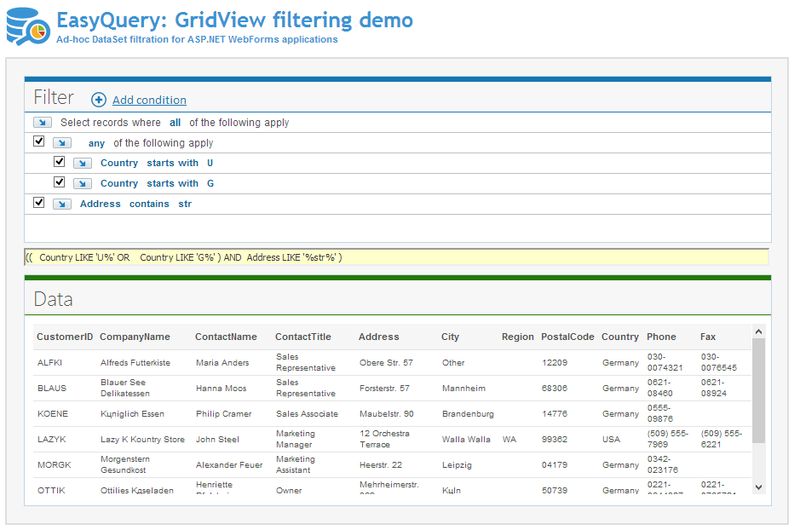 Now let’s imagine you want to have a form or some web-control that users can use to filter the results presented in the GridView. Moreover, it would be great to give them a possibility to define several filter conditions and a quick way to turn each condition on/off and see what happens with result dataset instantly. We need to create DbQuery and DbModel component and assign Query object to QueryPanel control. //Here is a function which loads data from the database. //but it may be a more complicated query of course. You can wrap these components into a new UserConrol and use the same approach for filtering in other web pages (.aspx), of your web-application, so that the look and feel, layout and behavior remains unified across the whole web-site.